Do You Know the Six Standard Mattress Sizes? Anyone who is considering a new bed needs to know about mattress size charts before getting out the credit card or checkbook. You might think it is rather simple, but actually standard mattress sizes can vary quite a bit, depending on where you live. Purchasing the right size mattress is even more important than buying the right-sized car! You can always trade in a car for a different model, but just try convincing the store to swap your mattress set for a different size! If they don't outright laugh at you, they'll certainly look at you as if you've lost your mind. Even thrift stores won't take used mattresses due to sanitation issues. Mattress size charts can be confusing if you've never put much thought into shopping for a mattress set. You may have simply put up with hand-me-down mattresses from your family member or a friend who needed to get rid of a mattress. Now you're ready to spring for a really good mattress, so the first thing to do is to get to know mattress sizes. There are actually six mattress sizes, each with their own special dimensions. 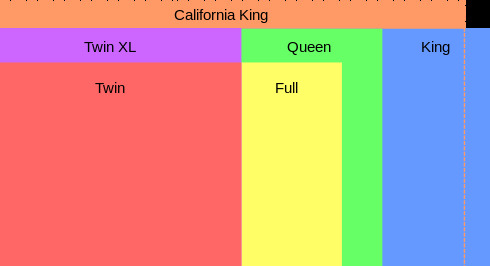 The names for each size are Twin, X-Long Twin, Full, Queen, King and that perplexing size called California King. No one really knows why California has a bed named after it! :-) You'll hear salespersons using these terms, and they will expect you to understand the meaning of each. Despite the fancy names, what really matters is the number listed on mattress size charts. Here's a simple list for reference, in both inches and centimeters. You may want to copy it to a 3x5 card to keep with you when shopping. Most people don't have any problem explaining why they want or don't want a twin mattress, also known as a single bed. Most twin sets are intended for a child's bed or the guest room. But, what about those oh-so-small differences in size between a Full, also known as a Double, and a Queen, a King and a California King? Most mattress size charts don't offer many suggestions; they just state the facts. One item that may not be obvious is the amount of inches per person that's used to calculate the different dimensions. Twin beds allow 39 inches width for the one person, presumably, who will be sleeping in the bed. X-Long Twins have the same width allowance, but give just a little bit of extra legroom in length, which accommodates most adults or growing teenagers. The Full and Queen mattresses are close in size, with the Queen being slightly wider and longer. Fitting two people into a Full can be a bit tight, given that the allowed width per person is only 27 inches, but a Full may be perfect for a single sleeper who likes to spread out. A Queen allows 30 inches width per person, which can mean the difference between an elbow in the side or room to stretch. A King mattress compares with a California King by a scant 4 inches difference. The King allows 38 inches width per person and is the same length as a Queen. The width of King is what appeals to most consumers, giving all sleepers plenty of room. The California King is actually narrower than the King, but adds 4 extra inches in length for those taller sleepers who can't stand having their feet dangle over the end! Mattress size charts come in very handy when you're ready to buy bedding for your mattress, or perhaps as a gift for a wedding or housewarming. There's nothing more frustrating than spending good money on nice, soft sheets only to struggle to get them over a mattress that's just too big! Even if you are tenacious enough to make that Full fitted sheet fit over that Queen mattress, it's likely you'll spend every morning trying to get it back on after the sheet has slipped off during the night. Some people also like to pick a flat sheet a bit longer than the conventional size so they can really tuck in the sheet at the end of the mattress. Here's a flat sheet reference related to mattress size charts for bedding that's also worth having on hand. Fitted sheets are equal to the measurements of the mattress. All these numbers can make a person dizzy and really don't tell the whole story. A good night's sleep is precious and can mean health and happiness versus fatigue and illness. To match the numbers to your needs, take one of your own mattress size charts with you on your search for a mattress. Lie down on a Full, a Queen, a King and even that strangely named California King! Feel how your body responds on 81 inches width compared with 108 inches width. Stretch your toes out and scoot up and down the mattress to simulate the way your body moves around during sleep. Roll around, stretch out your arms and really give it a test drive. If you'll be sharing the bed with a partner, have them join you and don't worry about what the salesperson thinks! You'll end up buying just the right mattress and will thank yourself every night as you drift off into a blissful sleep. Do you have a question or tip to share about mattress size charts?